Improvement of the management of the care service process, with a consequent increased quality of service to the citizen. Professional and institutional integration with improved results in terms of health of the person/user subject to the care process, as well as for his/her family. A reduction of the operating costs achieved through an improved use of resources on top of induced health benefits. Greater transparency of the processes, facilitating monitoring, control and quality of the care service. GETTING TO KNOW the care recipient through the multidimensional assessment and in-depth tests used by professionals following the philosophy that “knowledge must not be the prerogative of a few but must be shared by the entire team”. PLANNING according to the principles of Project Management, i.e., defining measurable and achievable objectives, how long the project lasts and indicating precisely “who does what and when”. ACTING, i.e. putting the planned activities into practice, as a means through which to achieve an objective. CHECKING, i.e. measuring the degree to which the objectives have been achieved and analysing the causes of successes and/or failures, in order to create new knowledge and, if needed, to adjust the plan in progress. The Atl@nte system is an IT instrument for managing care both in residential and home care settings. The ease of use of the system ensures that each caregiver (not only professional) who is providing specific expertise in the management of the care service, is able to make a contribution, each in their own professional area of expertise, by maintaining and updating a computerised data model. The essential feature of the Atl@nte system is its capability to adapt to the different working requirements of the organisations that use it. The same instrument is in fact used in a wide range of different settings, from individual services in local networks, up to complex local or regional health service organisations. This is possible because Atl@nte provides a wide range of tools that allow procedures to be customised, and more importantly, information to be protected from improper use. Furthermore, Atl@nte is highly flexible in terms of configuration, in that it allows easily complying with the management frame of the organizations where it is deployed. 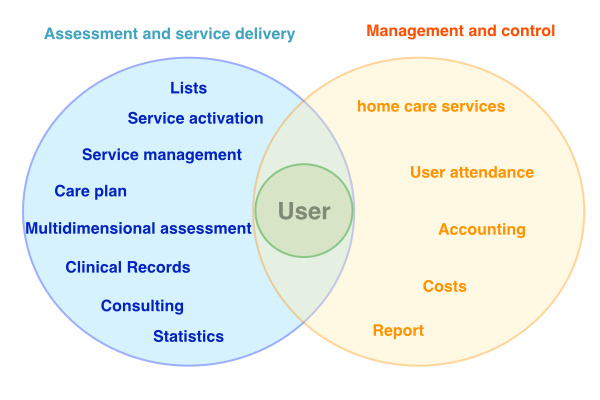 databases of users, connecting them, if necessary, to health service patient databases. Collection and storage of data and history of all tests and measurements taken by the services. Re-processing of data collected or any data by identifying profiles, classes and statistics. Macro-analyses of data collected using customizable research criteria. Production and collection of documents produced, directly in Microsoft Word, such as sample letters, summaries, certifications, etc., directly in the folder within the file system referring to the care recipient. Extraction of data, directly or by exporting into Microsoft Excel, for automatic processing and re-classification of data and graphics. Transfer of all information concerning the care recipient from one service to another through direct access to the database or through the Internet. Measuring the work activities of staff members in relation to each user. This feature can be used to determine workloads and drawing up reports. Complying with standards and regulations concerning rendering of accounts and regional and ministerial flows. Managing waiting lists and the preferences of users who wish to use the services. Atl@nte is based on a multidimensional assessment methodology for planning and management of person-oriented services. The use of a multidimensional assessment methodology, as means and method for measuring health, allows covering the various requirements, from the very beginning of the care service to the final check necessary to assess if results have been achieved. The importance of using a software tool for assessment of the users, lies precisely in the fact that it allows managing of information (whose structuring allows the definition of the assessment methodology) concerning the state of health of the user. It should be noted that the “state of health” term has to be meant in a general sense (i.e., in terms of functional, medical, cognitive, social areas) in order to ensure, properly and consistently, the collection of the information required to correctly “integrate” the services and the available resources into a comprehensive “model”. One of the key aspects, and indeed one the features which make the added value proposition of Atl@nte, is its user friendliness and its agility which allows frequent monitoring and update of the various facets which indicate (in an aggregated form as index) the health condition of patients subject to care services. This makes it possible to use Atl@nte to give timely response to the needs of persons assisted, whose conditions are constantly changing. The multidimensional assessment includes a variety of well-acknowledge scales, such as SVAMA, SVAMDI, ICF-CY and the internationally recognized assessment scale InterRAITM . The Atl@nte system is the only product in Italy which has been licensed for the use of the InterRAITM tools for multidimensional assessment (www.interrai.org). Sistema Atl@nte is developed by our associated partner StudioVega and distributed by Social IT.